Contemporary modern based dance company founded and directed by Anne-Rene Petrarca. The choreography is known for movement qualities that have organic undertones and contain rich details, strong circular shapes, seamless transitions, complex floor work and powerful locomotor movements. Danced with Sculpted Motion are Anne-Rene and guest dancer Angie Yetzke. They will dance in the doorway at the Martha Miller Center on the Hope College campus. 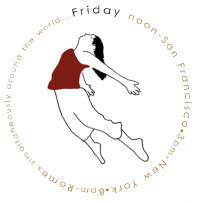 Danced with Anne-Rene artistic director of the dance company Sculpted Motion will perform Sculpted Labyrinth at the Berkeley Art Center.